Thanks to the font of beery information that is The Crafty Pint, the Australian Beer Writers’ Guild convened at the Terminus Hotel in Clifton Hill recently. Good god, the menu is superb, as is the massive dining room. Most of the folks went burgers and the like but I wanted to be difficult and test out the specials. They had a few asparagus dishes to celebrate its return to season. 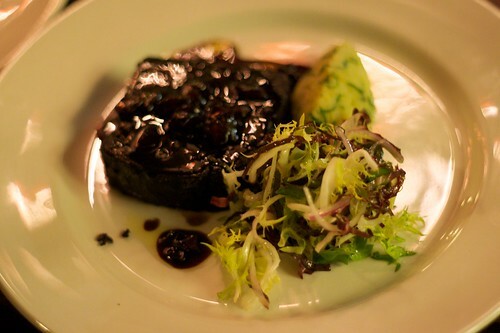 However, the first dish I chose was the house-made black pudding with pigs’ trotter sauce and kipfler potatoes. This is a rich dish and was perfect for the chilly not-quite-spring evening. Apparently as a (British) kid I loved black pudding. Thought it was about time I tried to reconnect with the childhood love. 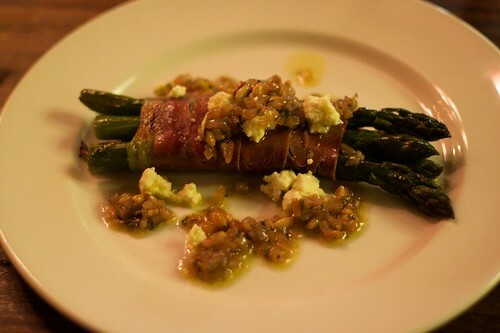 As my main, I decided upon the asparagus baked in prosciutto, with pinenuts and feta. You might think not substantial as a main, but after the black pudding, it was just what I was after. Might be something I can try reproducing at home too? Divine. 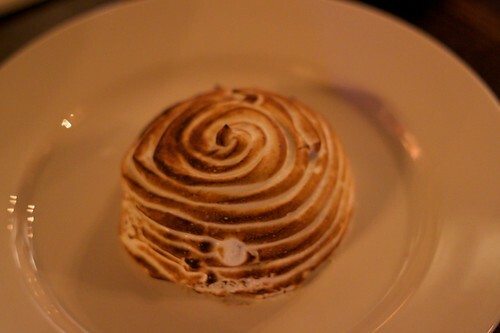 This meant room for dessert…again on the specials menu: baked Alaska. I begged to share one with Tris as it was $9 per person, but meant for two. A little bit pricey for its size and not quite as much finesse as the one at The Lincoln. No matter, it was baked Alaska, squee! It had banana ice cream inside, and none of that fake-tasting banana either. I actually chose dessert over beer too! 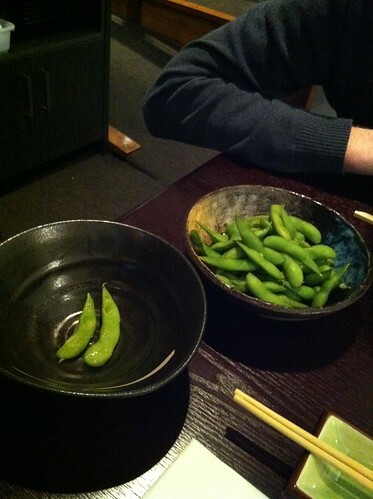 In what seemed like an excellent balance, Tris tested out some of the offerings on the standard menu. 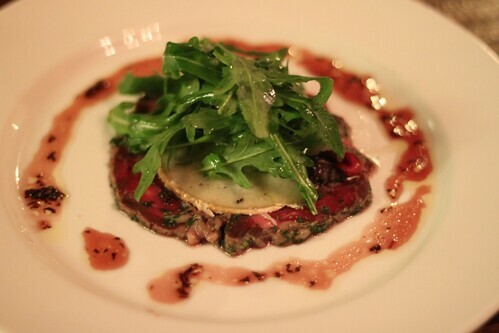 You have your parmas, burgers, salads and many types of steaks but he went with a carpaccio of beef, rocket, caramelised vinegar, truffled pecorino. 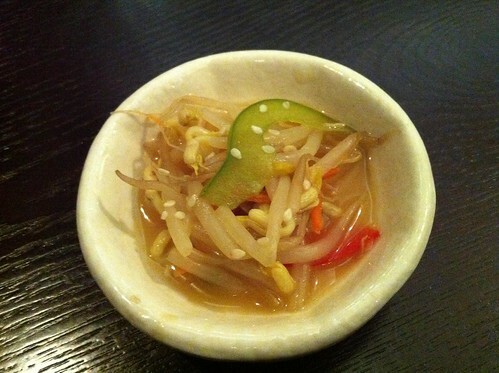 Quite refined for a starter! 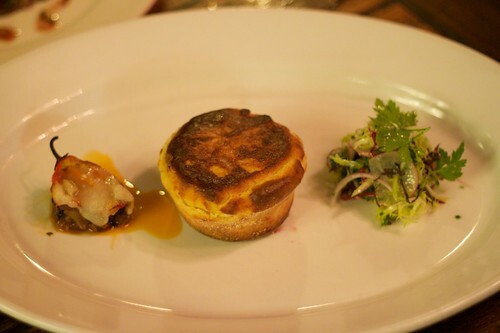 For mains, his selection was the English cheddar souffle with radish, frisee and pickled onions. If not for my wanting to sample the specials, I would most likely have chosen this as a main too. While the service was always courteous and friendly, it was a tad haphazard. There were a few mix-ups with our drinks orders, being the craft beer-swilling wanksters we are. They never seemed to give any of us who ordered the True South dark ale that when asked! We did also have to wait quite a while and despite indicating that we’d prefer entrées and mains to come out separately, they still came out together. 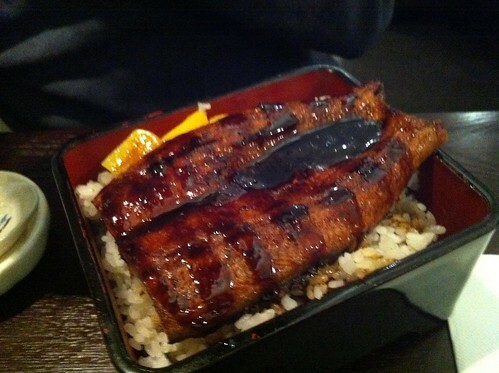 I wouldn’t hesitate to recommend it to other foodies despite this. Craft beer aficionados should definitely put this pub on their radar to visit – there’s a damn fine selection of good beer on tap. 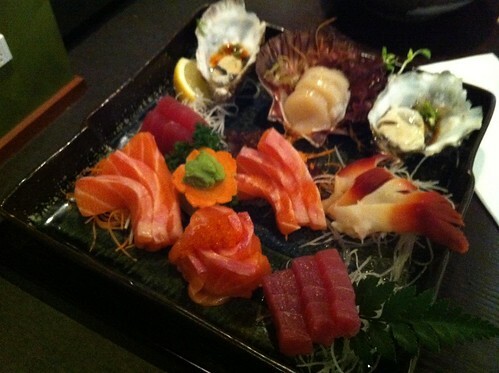 I’m currently in the process of persuading my parents to have a long overdue family dinner here one evening! This entry was posted in eatie-foodies dining out and tagged Clifton Hill, craft beer goodness, gastropub, Melbourne, North Fitzroy, The Terminus Hotel on October 29, 2010 by gem. 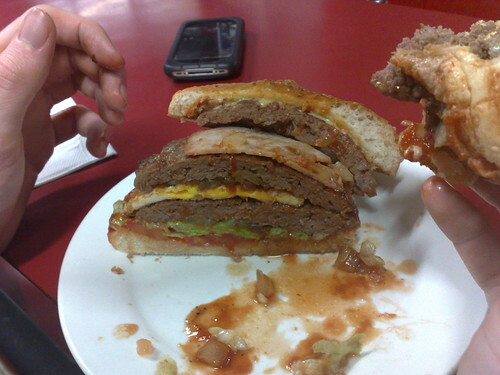 which man’s burger reigns supreme? Why is it that the best burger joints in Melbourne are just men’s names? You’ve got Danny’s in North Fitzroy, and Andrew’s in Albert Park, and both have excellent reputations. I finally got to try out the burgers at both and decide which for myself was the winner. I love cheeseburgers, and fast food burgers are cardboard, let’s be honest. Being out and about late at night in the city, Danny’s is an excellent choice – not too far out of the city, has a lovely diner feel and the burgers are made with fresh buns, shredded lettuce and patties. My dining partner’s burger of choice is the burger with the lot – cheese, tomato, egg, bacon. Often, several patties. I ordered a cheeseburger at Danny’s but couldn’t get a photo that really captured its glory properly. But here’s one of their chips. We ate more than we should have, but they were just so good. It made The Age’s top ten list a while ago when they did a feature on the best chips in Melbourne. The diner is really nice at Danny’s, but even though I’ve been in there several times of late, I don’t find the staff to be particularly friendly. However, their drawcard is they are open till 2am. If I’ve driven into the city for a gig and am feeling peckish after, guess where I end up! Andrew’s shut at 9pm and when I went there, it was packed. There isn’t really anywhere to linger and sit. Albert Park is nowhere near where I live (whereas at least North Fitzroy isn’t too far) so it’s a little bit of a problem not having anywhere to eat my burger. We ended up across the road on a park bench. Here’s my cheeseburger. Easily one of the best I’ve ever had. None of this plastic-tasting cheese business. 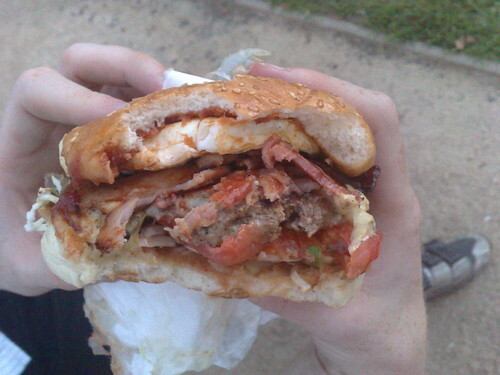 The meat patty and cheese together was so satisfying – more flavoursome than Danny’s. The burger with the lot is fantastic. Delicious meat patties and fresh, flavoursome ingredients. You don’t need to add extra condiments. 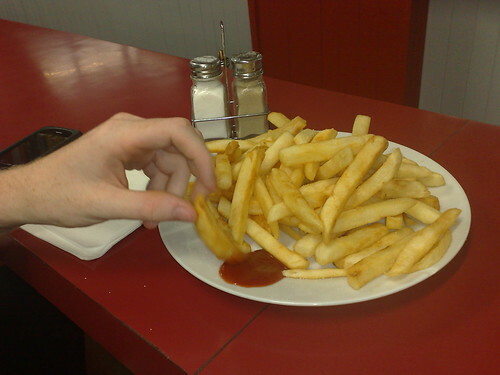 The chips, however, were absolutely awful – they were very dry and tasted old. I rarely throw food away, but these were turfed on account of how bad they were. By an inch, I would declare Andrew’s as serving the superior burger. Proximity and the late night opening means that I would most likely frequent Danny’s. 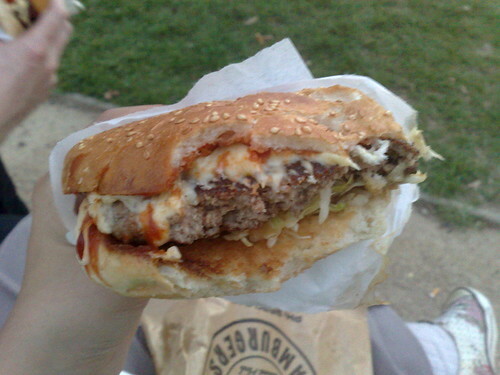 However, you can’t be disappointed by either when in the mood for a good old-fashioned (non-gourmet) burger. 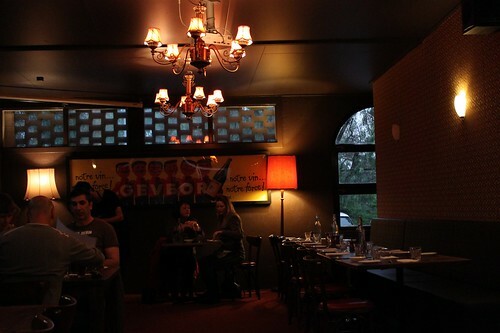 This entry was posted in eatie-foodies dining out and tagged Andrew's Hamburgers, burgers, Danny's Burgers, diners, fast food, Melbourne, North Fitzroy, South Melbourne, takeaway on March 24, 2010 by gem.